“We have now learned and seen that the world is different than it used to be a few decades ago,” said Shah at the Wilson Center on February 14. Energy, investment, and resources used to be “largely defined by public resource flows,” like those provided by USAID, but “today, we are a small fraction of that,” he told the overflow audience at a “National Conversation” event moderated by NPR’s Global Health and Development Correspondent Jason Beaubien. USAID has expanded its partnerships with U.S. corporations to improve food security and agricultural productivity in developing countries. “We’re working with Wal-Mart in a dozen countries around the world to help reach hundreds of thousands of small-scale farmers, providing technical assistance and support but also connecting them to a real market…that is going to be there for the long haul and sustain their gains,” Shah said. It’s all about what’s going on at the farm-household level. These are farmers who…often have a two-to-three month period during the year that everyone refers to as the ‘hungry season,’ when kids and mothers and fathers go without food or adequate nutrition. The bottom line is, for these 35,000 households, they’ve now beaten that. …This is the path to end widespread hunger without giving out food but rather relying on the industry and enterprise of small businessmen and women. He highlighted examples in maternal and child health, including USAID’s partnership with Johnson & Johnson. The Mobile Alliance for Maternal Action provides new and expectant mothers vital health information via mobile phone in developing countries such as South Africa, Bangladesh, and India. And GE is helping to bring power to hundreds of health clinics throughout East Africa, with the aim, Shah said, of putting a dent in high rates of preventable child mortality (globally, an estimated 6.6 million kids die before reaching the age of five). Another example is Family Planning 2020, an initiative that aims to provide voluntary access to contraceptives to least 120 million more women and girls around the world by 2020. Announced at the 2012 London Summit on Family Planning, the partnership involves governments, civil society, donors (including USAID), and corporations. “This is a partnership…to really work collaboratively to meet an urgent and key development priority right now,” said ECSP’s Roger-Mark De Souza. “It’s not only about U.S. corporate interest but global interests, and there’s a shift in that partnership model that’s more global and inclusive, and bringing both governments and local corporations.” According to the Bill and Melinda Gates Foundation, one of the sponsors, an estimated 80 million women had unintended pregnancies in 2012 and at least one in four resorted to unsafe abortion. 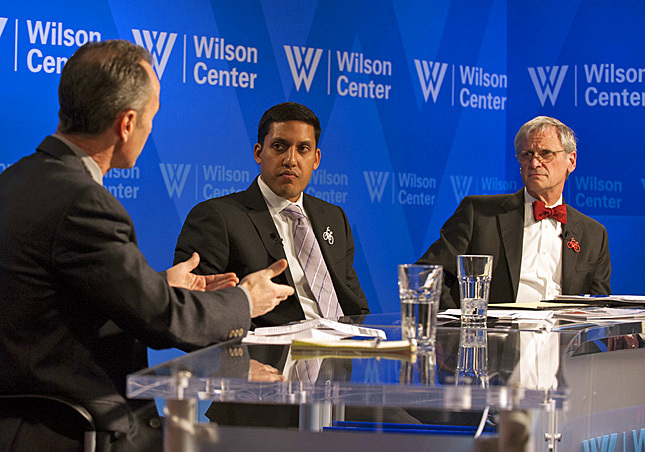 Photo Credit: Jason Beaubien, Rajiv Shah, and Earl Blumenauer, courtesy of the Wilson Center.